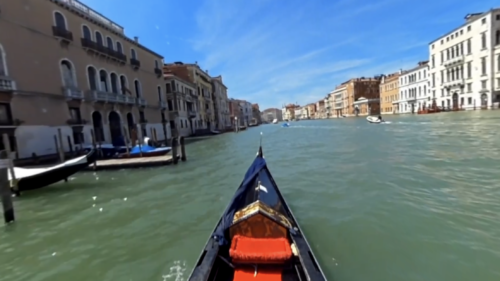 THE EDGE – Be Brave: an immersive Virtual Reality experience that puts the player in a virtual ambient. You’ll be at the centre of an incredible challenge, testing your survival skills and breaking your own limits. A breathtaking adventure, set in a rocky mountains environment, with an incedible level of VR graphic detail and surrounded by a crystal clear binaural audio. 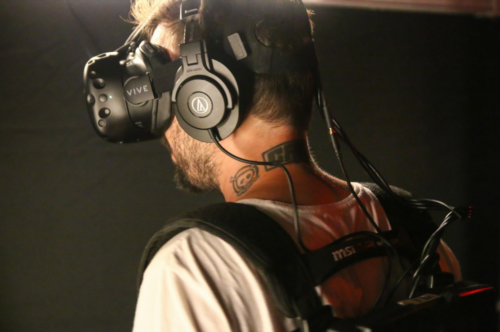 Uqido will provide VR headsets, backpack PCs and some specific custom hardware devices to obtain a level never seen before of immertion and emotion for the players. Sight, touch, smell, and sound, a new interactive attraction that will blow up your mind! 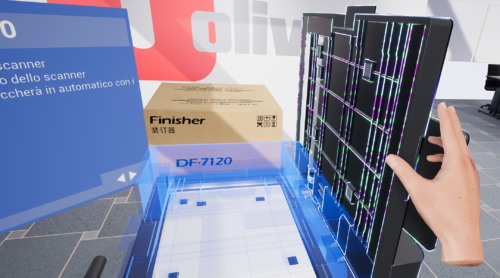 Olivetti Virtuademy is a virtual reality platform for training – developed by AnotheReality – that recreates objects and procedures with high fidelity, to allow everyone to easily learn tasks needed for their job. The platform presents full reproduction of multipurpose printers completely interactable, and recreates, step by step, various procedures, from the first installation to maintenance operations. The experience guides the user through every step, making him learn through doing the procedure, and testing him through evaluation modes that can be used during certification courses. The fascinating world of old black-and-white and 8 bit videogames. Pong, Atari, Commodore 64, Sinclair Spectrum: join in for another ride with these old-school masterpiece that built up the videogame industry 30-40 years ago! 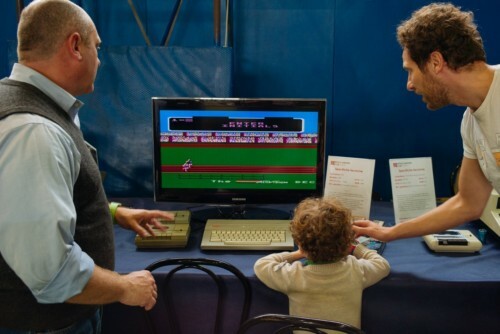 The Vintage Computer Club Italia as always is happy to introduce young generations (and gather older ones) around the origins of personal computing and videogames. There’s never enought nostalgia and romanticism about the epic beginning of computing. 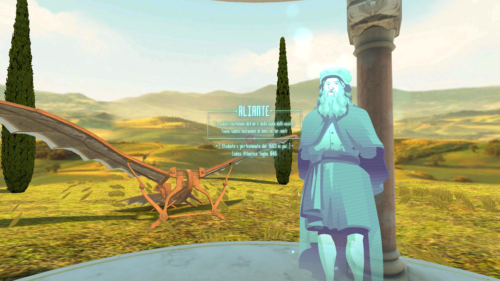 Da Vinci’s Mysterious GearWorks videogame is the first of a series of 3D Gaming and VR Apps. Leonardo appears as an hologram recruiting brave young people to test his impossible inventions. 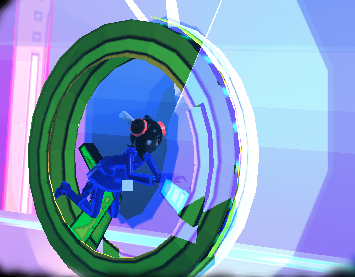 Players can choose between the Glider, the Tank, the Diving Apparatus, the Bombard and the Helicopter. With these inventions players will be able to have fun while exploring Leonardo da Vinci’s Virtual Reality world using an Oculus device. High Speed Race 2 is a car racing game currently under development with Unity3D and will be released to the public by 2018 on Microsoft Store (Windows 10 and XBOX One). The Players have several cars available including: GT3 series, DTM 1992, NASCAR, Rally cars, Go-karts, road cars and open-wheeled cars. Other classes will arrive with future updates. The circuits will vary according to the chosen class (race tracks, kart tracks, city tracks or dirt tracks). Currently, the game supports all types of Google cardboards (VR), Xbox one and PS4 controller, Racing wheels and pedals. Motion capture systems are getting cheaper and more common, but are still not affordable for most users and, more importantly, they work under proprietary licenses. You can’t modify the way they work, or use part of them in another project. 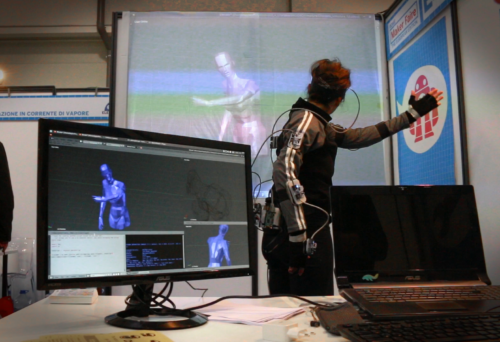 As an alternative, this is a motion capture system that can be easily assembled by anyone. Additionally, it is an open hardware-software framework that can be freely tweaked, enhanced, or used as part of another project. 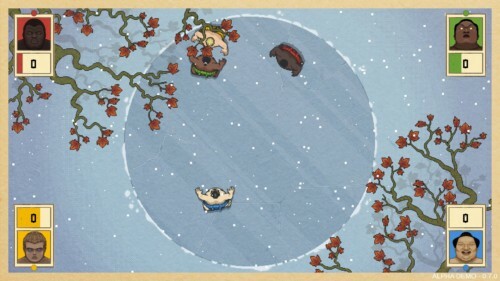 Circle of Sumo is a fast-paced competitive local multiplayer, with dozens of different arenas where players alone or in teams, fight for supremacy of the ring in an intense challenge of power, precision, reflexes and cunning. But Sumo is just a starting point: the basic mechanics of the game have been explored in order to make Circle Of Sumo a real minigames box, a sort of kaleidoscope of playable pills with a joyful and inclusive soul, while keeping its purely competitive aspects, such as controllers precision and characters’ statistics. So, not just Sumo arenas wherever imagination can see a ring (such as a traditional dohyo, the top of a tower, traffic roundabouts, desert islands, spinning carousels, golf courses, sunny cemeteries, dark attics and many other unlikely places where the game’s leitmotiv shape, the circle, is the only thing they have in common) but also a multitude of minigames for everyone’s taste including many original creations, some reimagining of sports like football and hockey, and tributes to the history of videogames like Pong and Frogger. 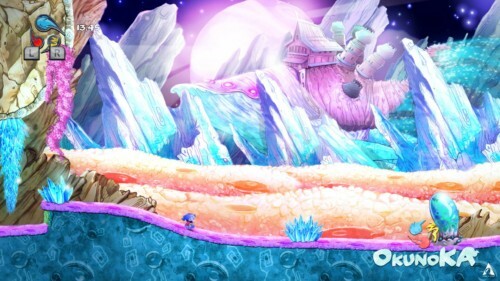 OkunoKa is a 2D “Masoscore” platform game, featuring a top-level art design, instant play sections based on immediacy, in an enjoyable casual approach that provides an ever-increasing challenge for all kind of players. Project New Dawn pushes the Players to find a way to defeat every enemies and solve every problems on the road based on how and which Hackings ability we decide to develop in the relative tree of skills. Generally will not be easy and we should understand the enemies behavior and you must also examine the area to understand how and when you can use your Hacking learned to win. To perform Hackings you will use a computer installed on your sword, which can evolve, strengthening it with new parts or create a new one to customizing it for your character. DOT is awakened by a creative and takes self-awareness. and provides her with tools to escape from the net. and discover at the end of the journey who she really is. Is DOT just a software or is it something else? 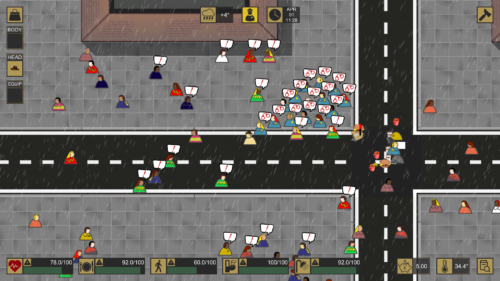 Hard Times is an extreme urban survival game where you have to put yourself into the shoes of a homeless man, taking on all the challenges that daily survival places in the great metropolis of indifference. You will have to look into junk, beg for money, escape corrupt policemen and citizens maniac about decorum. You will feel hunger and cold. You will suffer in the long rainy nights and be glad when you can get a decent meal. You will have to learn to build your own tools by yourself, craft and recycle objects to gain resources. You will make artifacts of all kinds, including furniture, work benchs, kitchens, beds, cardboard boxes, storage containers for your little treasures and much more. You will probably have to give up your innocence to survive. Small thefts and looting will become a gesture of self-preservation, beyond any moral judgment.